All military campaigns are influenced decisively by the terrain and geography in which they are prosecuted. Indeed, the assessment of geography is perhaps the single most significant factor in military planning. In the American Civil War, the Union was compelled to invade and occupy an extremely diverse range of geographical and maritime environments. Equally, the Confederacy was required to defend and operate in them. The Confederate states were expected by both sides to be the primary area of military activity, and these were divided into three broad theatres of operation by the dominant geographical features of the Mississippi River and the Appalachian mountains. It was never anticipated that significant operations would occur in the northern states of the Union, although the capital district around Washington was always perceived to be at risk because of its vulnerable position at the border of the two sections. The three main theatres of operation on land may be termed as the Eastern, the Western and the Trans-Mississippi, separated by the Appalachian Mountains and the Mississippi River. There were also active theatres of operation along the Atlantic and Gulf coasts and in the margins beyond and between the three major theatres but they were tangential. Operations against Native Americans and others as far west as the Pacific involved comparatively small forces and while very important in the nation’s evolution and for those regions, they were tangential to the main internecine conflict. Long distances, poor communications, and transportation challenges meant that for most of the war each of the three theatres operated autonomously, and at times in complete isolation, despite the efforts of both governments to coordinate them. Geographical barriers and distances meant that rival commanders often contended to secure a greater share of troops, supplies, and attention for their own theatre without a clear sense of the wider strategic picture. Dispersion of force and effort was a particular problem for the Confederate high command. The tension between the necessity for static troops to garrison vital ports, coastal forts, and fortifications along the lengthy navigable rivers and coasts, and the need for field forces of sufficient size and manoeuvrability to seek a victory by force of arms was a major cause of dispersion of force. Large transfers of Confederate forces between theatres occurred infrequently and tended to achieve only a temporary local superiority which could usually be re-balanced more quickly by the Union than the Confederacy. The Confederate high command had to adapt to new threats and changing lines of advance and while they shifted forces inventively, they were achieved decisive superiority in any theatre. Commanders contended for priority for their own theatre as they each struggled to secure a sufficient share of troops and supplies to defend their own region or to launch a decisive operation that might deliver victory. When large forces were transferred between the major theatres the donor theatre was necessarily weakened or rendered passive. For example, in 1862 a large proportion of Confederate in the Trans-Mississippi crossed the Mississippi eastwards to reinforce the Western theatre; in early 1863 some troops were moved away from central Tennessee to defend the line of the Mississippi; in late 1863 a significant portion of the Confederate army in Virginia was sent to strengthen the offensive in Tennessee. In each case they left behind a weakened sector. In most cases, operational passivity was enforced in the theatre that had lost its field forces. Demands for such transfers were therefore often resisted by the providers as they predicted a dangerous shift in the balance of forces in their own theatre. The Atlantic coast was a source of Confederate reinforcements on a number of occasions but this could only happen whenever the Union naval threat had receded. The movement of smaller forces such as brigades and divisions from sector to sector or even between theatres happened fairly frequently, usually in response to an urgent need for reinforcements to oppose a Union advance or to permit a Confederate offensive, but this was rarely on a decisive or strategic scale. Offensive operations were pursued by the Confederates as often as possible in each theatre – in search of the elusive victory by force of arms. However, the strategic initiative was seized simultaneously in the Eastern and Western theatres only once, in the autumn of 1862. After the loss of the Mississippi River in mid-1863, strategic autonomy was imposed on the severed Trans-Mississippi region, coordinated action with the region became extremely difficult. Each segment of the Confederacy faced a unique threat of invasion and although strategic priorities might be set centrally, the principle of states’ rights meant that the government could not neglect any region without risking the whole philosophical paradigm of the Confederacy. Individual states were at war chiefly on the principle of defending their states’ rights, so it was political anathema to deny any particular state or region the protection and autonomy it craved in favour of the whole. The principle of states’ rights underpinned the secession of the Southern states but it also prompted some state governors to vie with the government about where their “own” troops and commanders should be employed. Some states – particularly Georgia, withheld supplies and men or restricted the use of their state troops in order to secure their local interests above the national interest. 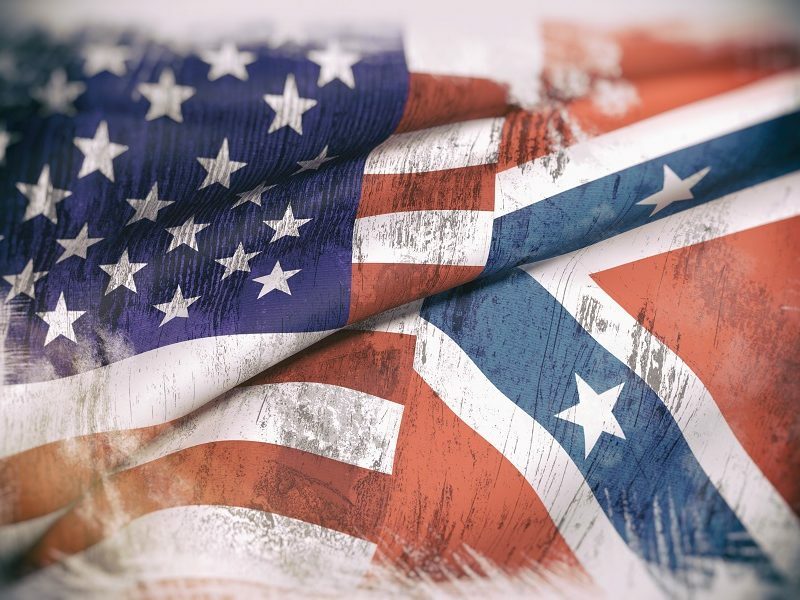 This fundamental political weakness exacerbated the geographical challenges already inherent to the strategic coordination of the Confederate war effort. The greater population, industrial economy, and commerce of the Northern states meant that they could create and sustain larger armies and supply them more adequately than the Confederates. As a result, the Union armies were usually able to achieve a numerical superiority in every theatre. However, this advantage was offset by the need to assign large forces to protect their lengthening supply lines and a dangerously exposed military infrastructure. A significant proportion of the Union armies were dispersed to garrison lines of communications and key depots and strategic locations against wide-ranging and destructive raids or interference by guerrillas, usually amid a hostile population and sometimes in inhospitable terrain. Late in the war, the Union armies learned to cut loose from their conventional supply lines, surviving by “living off the land” and devastating great distances along their line of march. This approach was applied increasingly during the war by Union commanders like Sherman, Sheridan and Grant but it only became possible when the threats facing restricting their ability to forage on the move had diminished to a manageable level. The stronger economy and industry and larger population of the Northern states enabled the Union to organise and supply larger and better-equipped field armies than the Confederates. The military fortunes of the Confederacy rose and fell with the availability of mobile field forces to repel the relentless progress of the invaders. Whenever larger forces could be concentrated, the Confederates tended to use them aggressively to strike a knock-out blow on Union or Union-occupied territory (Maryland and Kentucky in 1862, Pennsylvania in 1863, Tennessee in 1864) or to hinder the invaders by launching raids or expeditions into Union-occupied territory. Large Confederate forces were besieged and captured at vital strongpoints (Fort Donelson, Vicksburg, Port Hudson, Petersburg), partly because mobile forces could not be gathered in sufficient strength to come to their relief and partly because the Union besiegers could stay in place and be reinforced for as long as necessary. The siege of Corinth in 1862 would surely have had a similar result had the Confederate garrison not abandoned the town. Large Union surrenders also occurred (including twice at Harper’s Ferry), and many tactical defeats resulted in large numbers of Union prisoners, but the major sieges of Union garrisons at Chattanooga, Knoxville and Suffolk were either abandoned or defeated because the Confederates could not impose an impermeable siege. The Union enjoyed an extensive and growing system of railroad and river communications, enabling the transfer of larger and larger forces between theatres. The Union increasingly used its strategic mobility to shift the direction of its attacks. At times these moves involved one or two divisions but by 1863 entire corps or even small armies were being transferred. As early as the spring and summer of 1862 two Union armies converged at Shiloh and were joined by a third for the march to Corinth. Although these forces were subsequently dispersed, the principle of concentrating forces within and around the western theatre had been tested successfully. In 1863 the Union IX Corps moved from Virginia to Kentucky, on to Mississippi and then back to Tennessee via Kentucky before being sent back to Virginia in 1864. The same peripatetic command had already operated in North Carolina, Maryland, Virginia and West Virginia during 1862. In late 1863, the XI Corps and XII Corps were shifted from Virginia to Tennessee and Georgia to match a comparable Confederate transfer but while the Confederates were forced to return to Virginia the Union force remained a permanent part of the Union western command. During 1863 and early 1864, parts of the Union XIII Corps, XV Corps and XVI Corps were transferred continually – and bewilderingly – around the western theatre between Tennessee Mississippi, Arkansas and Louisiana. The experience of Major-General A J Smith’s far-travelled command is a perfect example. The convergence of Union troops to relieve the sieges of Chattanooga and Knoxville involved troops from four different armies in Mississippi, Kentucky, Virginia, and Tennessee. Some travelled by rail, many by river and others marched long distances overland. But these movements were simultaneous, efficient and largely unhindered. Nor did their removal put at risk the sectors from which they were withdrawn. By 1864, the Union’s military, transportation and logistical capacity were so great – and the strategic coordination of military effort now so advanced – that entire armies could move between theatres efficiently and rapidly. For the spring campaign of 1864, decisively superior forces were concentrated in Virginia and northern Georgia by drawing men from rear areas and garrisons, the capital’s defensive fortifications and the Atlantic Coast to focus irresistible superiority of force in the two key sectors. At the same time, peripheral operations were still maintained in the Trans-Mississippi, Appalachian and Gulf regions. In late 1864 Union forces were shifted en masse to the Shenandoah Valley in response to desperate Confederate efforts to divert Union troops away from the stranglehold at Richmond and Petersburg. The strangle-holds were never broken and once the diversions had been crushed, the return of these troops to the siege presaged the end in Virginia in 1865. Sherman’s March through Georgia in 1864 was followed by the even longer and difficult march through the Carolinas, a strategic transfer of force that exposed the impotence of the Confederates to oppose them. When the Union Army of the Ohio was shifted from Tennessee by rail to the Atlantic Coast and thence to North Carolina by sea it provided the final nail in the coffin of Confederate resistance. Likewise, in 1865, irresistible Union forces were shifted to Mobile and then ran rough-shod through Alabama. These two latter movements were not necessarily essential for the ultimate victory but the fact that they could be conducted in addition to the primary overland campaigns of Grant and Sherman is informative, and not just because they demonstrated the Union numerical and logistical superior. They also show the confidence of the Union high command to coordinate large and far-reaching campaigns simultaneously across vast distances. At the same time, substantial Confederate forces were neutralised in the Trans-Mississippi theatre; they were a nuisance but the Union high command declined to launch an unnecessary invasion in a region which now had little strategic value. The Union was exercising intelligent strategic decision-making and almost limitless mobility and flexibility while the Confederate armies were largely immobilised and had exhausted their capacity to take the strategic initiative. Preponderance in military force was a key factor in Union victory but there are plentiful examples in military history where preponderant military powers have been out-thought and out-fought by smaller but more competent foes. But even the shred of hope of overturning the balance of power was denied to the Confederates by mid-1864. As long as Union offensives were conducted in isolation, the Confederates could try to shift their weaker forces along interior lines to oppose them with some hope of success. Once the strategic coordination of the Union superiority of force and mobility could be asserted to move their forces rapidly and efficiently within and between theatres, the Confederates were doomed to defeat. In spring 1865 the resources of the defenders were had been stretched beyond breaking point and the splintered nation was forced to concede that it had been decisively and irrevocably defeated. Despite ingenious efforts to fabricate a navy the Confederates never seriously challenged, except briefly and locally at key ports and rivers, the Union command of the seas and waterways. The Confederate Navy was exceptionally innovative, devising new weapons and defensive tactics that achieved remarkable local successes. However, overall Confederate naval weakness was exploited from the outset by the Union. Had the Confederacy inherited or been able to construct a navy of comparable force, one might speculate that the “Anaconda Plan” would have been far more difficult to implement and the Confederacy might have endured to secure its independence. Recognition by France and Great Britain not only carried diplomatic and political weight, but the risk of an intervention by their navies would have seriously undermined the Union war effort. It took two to three years for the near-moribund US Navy and river fleets to expand sufficiently to achieve total supremacy but that process was irresistible and inevitable. Union sea power facilitated the suffocation of the South through an increasingly impervious blockade. It also permitted expeditions to almost every coast and navigable river of every Southern state. Some operations achieved only local benefit but others were of decisive strategic significance. The Confederates attempted to reverse the balance of sea power with aggressive privateering, commerce raiding and blockade running but these operations could only ever be irritants – they deferred the inevitable approach of economic and military exhaustion but could not prevent it. The Union capacity for river and sea transportation grew so significantly that by 1863 entire Union armies were being supplied by water and transferred between theatres of war. While the rivers provided largely secure routes for supply and transportation for the army, control of the major rivers gradually split the Confederate theatres and hampered their strategic mobility and communications. The Union forces repaired, extended and even built new railroads to move troops rapidly and in large numbers, bestowing an unprecedented strategic mobility. Railroads offered the capacity to supply armies even in desolate regions, although the pace and carrying capacity of horses and mules to move supplies from railheads to the armies still imposed severe restrictions on overland movement. Relentless raids by the Confederates frequently severed and destroyed these vital railroad links. This had a significant impact in the early years but the disruption became less damaging as the Union army honed its ability to repair railroads, and found effective methods of protecting its long and exposed lines of communication. Furthermore, some Union commanders learned from experience that a temporary departure from the conventional railroad and river supply-lines was not necessarily fatal if done with speed and against weak opposition. Grant and Sherman tested the surprising capacity of the more fertile parts of the South to sustain their armies on the march through foraging and forced requisition and this discovery not only resulted in irreparable damage to the Southern economy but also unforeseen mobility for their armies. The Confederate railroad system had expanded before the war and while it was extensive, it was only partially connected, with strong North-South and local lines but only one fully connected East-West route. Union raids against Confederate railroads, especially from early 1864 onwards, were increasingly aimed to disrupt the railroads and manufacturing capacity. The erosion of both meant that the ability of the Confederates to repair their infrastructure was fatally reduced by the final year. The Confederate armies learned early on to live partially off the land as they moved – achieving some remarkable feats of marching – but the necessity to keep moving even in regions of plentiful supplies imposed an irresistible brake on military planning. Industrialisation was advancing rapidly before the war in many Union states and engineers, inventors and manufacturers were lauded, rewarded and inspired to innovation. They developed new levels of efficiency and resourcefulness in managing the methods of mass production and their products. The Union high command, especially in the Navy and technical branches, showed imagination in adopting new weapons and techniques; experimentation was generally encouraged if not always adopted. The production of ships, small arms, artillery, ammunition, clothing, processed rations, railroad equipment, telegraph wire and a myriad other tools of war progressed exponentially in the North, and productivity rose to hitherto unimaginable levels. The Union was able to provide more and more machinery of war, stimulating expansion and economic development. In the South, the demands of sustaining a modern war tested and finally broke its economy. The industrial infrastructure of the Confederacy was small; engineers and manufacturers were indefatigable and determined in their efforts but their efforts were exemplified more by improvisation and expediency than efficiency. The weak industrial base of the Confederacy grew but not on the mammoth scale experienced in the North despite many feats of remarkable resourcefulness. These material disadvantages affected supply to the armies and navy which often struggled with insufficient rations, insufficient military equipment, unreliable ammunition, and inadequate supplies, even when there were some areas of abundance. The capture of large quantities of Union supplies, weapons and equipment early in the war, supplemented by growing imports by blockade-runners and desperate measures in production, helped the Confederate army to endure far beyond reasonable expectation. The agricultural economy of the North was productive and efficient, and more than sufficient to sustain the population and the war machine. There were shortages and scarcity but usually only because of inefficiency, bad weather or interruptions to the lines of communication. Union resources and strategic direction were coordinated with increasing clarity and impact as the war progressed while the erosion of the Confederate economy and infrastructure caused increasing dislocation. Union troops could voice justifiable complaints about the quality, variety, and quantity of their rations but almost invariably they fared better than their Southern counterparts. Confederate agriculture was abundant, but was more focused on cash crops and food for subsistence rather than for surplus. “King Cotton” had spurred pre-war prosperity in the South and while the reduction in supply by the Union blockade had a harsh impact on the cotton-hungry industries of Europe, it was not severe enough to force intervention. Although Southern agriculture was locally very productive, the weak transportation system meant that the plenty of one region could not often be moved to alleviate the poverty in another. Southern agriculture relied on slave labour, a resource that dwindled in both numbers and reliability as the Union armies penetrated further and further into the economic heartland. The arrival of Union troops and ships drew slave labour from the fields into Union service or the uncertain pathways of emancipation. The enlistment of a very high percentage of Southern white men into the armies affected productivity across the mainly agrarian economy. The diversion of labour to military service in the North was proportionally lower and was distributed across more sectors. So, while mass enlistment had an impact, it could be managed more easily, especially because immigration could help to alleviate the demand.